So many people went to join the Wednesday Intensive Action at the Pier in Awa that only 12 people were left to resume the sit-in from 8:30am. But they were removed within several minutes. Cracked stones were delivered to be used for construction of K8 seawall. The leader for today, Mr. Shiro Masaru appealed. The police men listened in silence. Today’s delivery was 289 truckloads. Three boats and 17 canoes were on the sea to protest, and tried to go over the floats at the end of K8 seawall, but were blocked many times by the Coast Guard. The picture shows the Coast Guard and the Army Police threatening the canoe team. It was sighted sometimes that the Army Police members wore a gun on hip, which makes it neccessary for the canoe members to boost up greater courage to go over the floats. The below video shows the Intensive Action on the Sea organized on March 25th. Wednesday Intensive Action with 150 participants. Larger the number of participation, louder the protest calls. And it cheers our spirit. During the lunch break, a contribution of sweet bean soup was delivered and made us temporarily feel as if we were on a picnic. 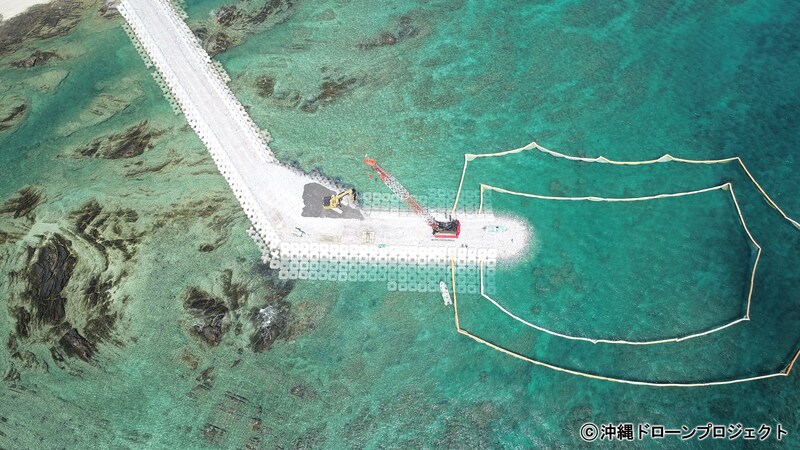 It seems that no shipping is to be made from Shiokawa Pier judging from carrier ship deployment. Today, 325 truckloads of earth and sand were delivered, and 3 carrier ships left the Pier. Last month, two law suits that cropped up during our protest movement received judgement. One suit involved Mr. Medoruma Shun who was illegally arrested and detained by the US military force and the Coast Guard. He was arrested by the US military force for entering a temporarily restricted area and detained for 8 hours. As per agreement between USA and Japan, a person arrested by the US military force must be transferred to a Japanese authority within approximately 2 hours. 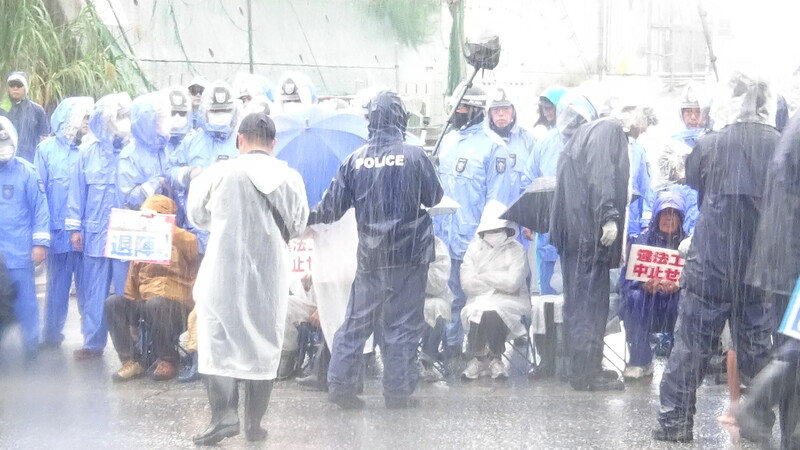 It was judged that detention of 8 hours was illegal and that Japanese government must pay JPY80,000 in compensation. 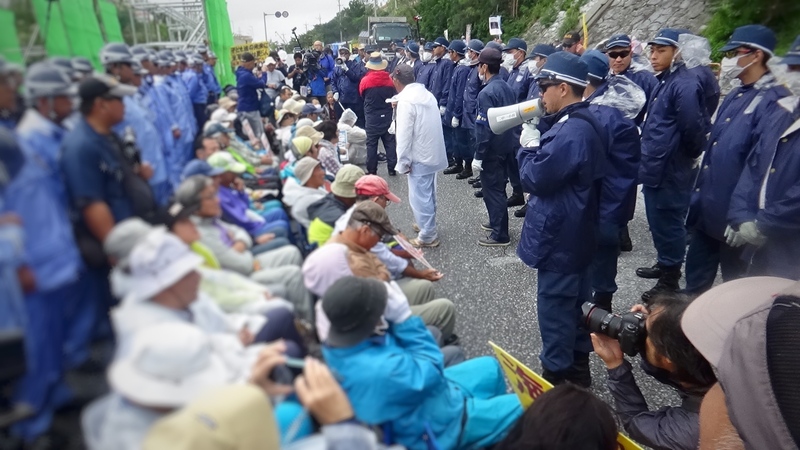 However, Mr. Medoruma appealed that the concept of “exigent arrest” itself is illegal to the Higher Court in Naha on April 3rd. Another case was regarding an incident that the Coast Guard members overturned a protest boat on April 28, 2015. The case was dismissed because it was judged that actions taken by the Coast Guard were within the realm of ordinary security activities and not illegal. However, it was a fault of the Coast Guard to send men aboard the protest boat when it was obvious that additional persons on board would lead to over-loading that causes overturning, wasn’t it? The below picture shows it. 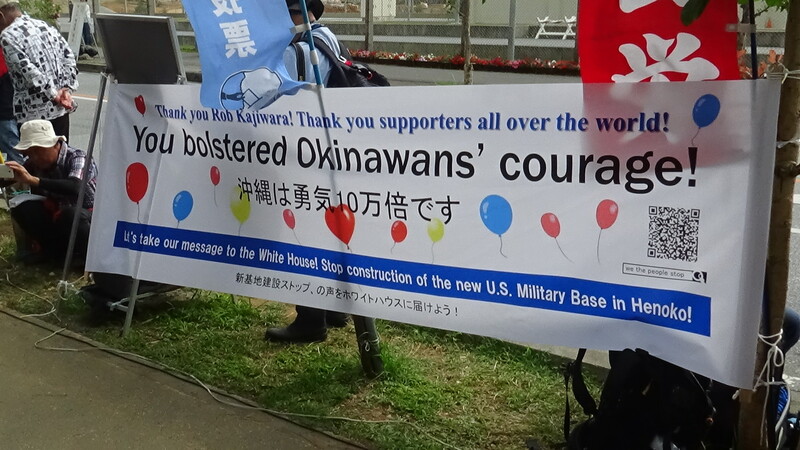 Next post Apr 4 (Thu): 7 banners and a tent were stolen in Awa and Takae, respectively. / Rocks were dumped with a roar into the sea at the K8 seawall.